a book review by Kate Coombs: How Do I Love Thee? It takes a certain amount of daring to adapt a famous love poem for grownups for the picture book crowd, and Jennifer Adams pulls off the feat with panache, creating a simple, lovely adaptation of Elizabeth Barrett Browning’s sonnet #43, or “How do I love thee,” with the help of illustrator Christopher Silas Neal. In the same way good illustrations complement a picture book text, Adams’s adaptation complements the original. She wisely chooses to leave out some of the grander concepts such as “the passion put to us/In my old griefs” and “my lost saints.” Adams also rearranges some of the phrases from the original to group related ideas and create a sense of pacing. It’s nice to see that the author keeps the pronoun “thee,” which parents and teachers will be able to explain easily to children, and which creates a softness and slightly old-fashioned feel. 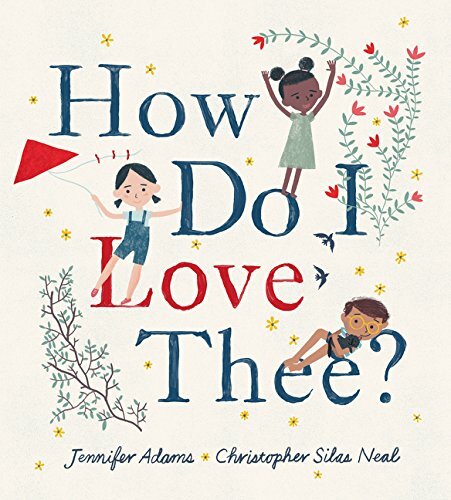 Of course, Adams begins with “How do I love thee?” Illustrator Neal shows us three children (nicely multiethnic) sitting on a tree branch, holding hands, and looking sweet without being saccharine. The following page pans out to show the entire tree with even more children playing on it and the accompanying words: “Let me count the ways.” It is clear that the book is about the love between children who are friends, not romantic love. We follow the first three children throughout the book. Adams adds her own poetry to the phrasing without troubling the original. Where Browning wrote, “I love thee to the depth and breadth and height/My soul can reach,” Adams writes “I love thee deep and wide and high,” which Neal illustrates with the children riding a submarine and then a boat in an ocean view that includes birds above and a whale beneath. Browning’s “I love thee . . . by sun and candle-light” becomes “I love thee in soft sunlight and rain-drizzled night,” with a later mention of “stars and firelight.” Adams adds some well-tuned phrases about loving thee in spring, fall, and winter, as well as morning and night (“and at end of day’s goodnight kiss”). In other spots she largely keeps the original wording, as when she uses two of Browning’s phrases, “I love thee . . . when feeling out of sight” and “I love thee to the level of every day’s/Most quiet need” to create “And when out of sight and in every day’s most quiet needs.” The balance works well. It should be no surprise to learn that Adams cut her teeth on literary adaptation by writing more than two dozen board books for the BabyLit series (Gibbs Smith). But a picture book gives the author more room to play with as she captures the wonderful ways children—and people in general—love each other. Neal’s illustrations are a happy accompaniment to the text, turning phrases that might have been static into a variety of actions—including night scenes, day scenes, near and far scenes. His rendering of “fall’s red trees” as a bird’s-eye view of falling leaves with the children looking up from below is surprising and appealing. The book ends with “And I will always love thee,” followed by Browning’s poem printed on the last page. How Do I Love Thee? will give parents and children a chance to say “I love you” to each other. The book would make a comforting, tender good-night read, but could also be read in school, where children could talk about the role of love in human life, perhaps making pictures of their own friends and family. And frankly, adults might want to give each other the book for Valentine’s Day or an anniversary. Adams’ and Neal’s homage to Browning’s poem is a book to love. Kate Coombs is a children's book author whose most recent title is Monster School (Chronicle Books, 2018).